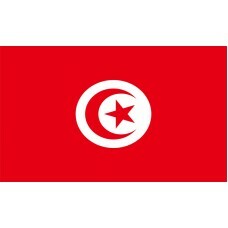 The Tunisia flag features a red field with a white disc in the center that features a red crescent and 5-pointed star in the middle. 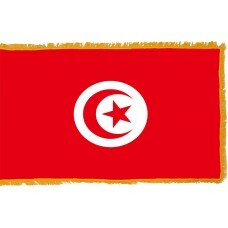 There are various interpretations to what the colors and symbols of the Tunisia flag represent. The red color represents the struggles and blood shed by the Tunisians during the Turkish attacks in 1534. Red is also the traditional color of Islam and it symbolizes the resistance against the Turkish supremacy. The white color represents peace and the 5-pointed star and crescent of the Tunisia flag as well as being a symbol of good luck, they represent the unity of all the Muslims and the five pillars of Islam. 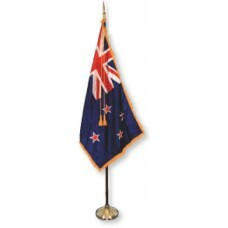 The disc in the center represents "the radiance of the nation as the sun." The Tunisia flag was officially adopted as a national flag in 1959 but was adopted as the naval sign of the Kingdom of Tunis in 1831, which makes it one of the world's oldest flags. Tunisia is a country in Africa (the smallest country) and shares borders with Algeria, Libya, and the Mediterranean Sea. The largest and capital city is called Tunis (which is where Tunisia’s name originated from). In the 8th Century BC, the Phoenicians founded Carthage in Tunisia that fought with Rome from 264BC until their defeat in 146BC. Following the Roman's victory, Tunisia became a Roman Province for over 500 years. In 697, the whole of Tunisia was conquered by Arabs and was later ruled by the Ottoman Empire for over 300 years. In 1881, Tunisia was invaded by France and officially became a protectorate of France on May 12th, 1881. Tunisia remained a French Protectorate until it gained independence in 1956. The majority of Tunisia's economy relies on agriculture, mining, and tourism. Tunisia attracts approximately 7 million tourists a year which makes it one of Africa’s most visited countries. Tunisia is home to many old and historical attractions as well as home to some of the most beautiful beaches in the Mediterranean. One of its most popular attractions is the "Amphitheatre of El Djem" which was built in 238AD when Tunisia was part of the Roman Province of Africa. It is considered to be one of the most well-preserved ruins in the world as well as being one of the biggest amphitheaters in the world. The "Baths of Antoninus" are the largest Roman Thermae (baths) that were built on the continent and one of the largest three in the whole Roman Empire that are another of Tunisia's most famous landmarks. Another main attraction is the "Medina of Tunis" that is located in Tunisia's capital city and contains 700 monuments that include palaces, mosques, museums, and fountains. The capital city Tunis is also home to the "Bardo National Museum" which is thought to be one of the most significant museums in the Mediterranean basin and is also the second largest museum in Africa and displays Tunisia’s diverse history through the many civilizations. 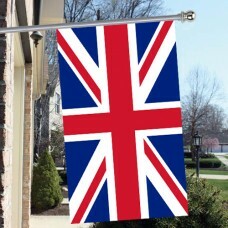 O defenders of the Nation, hasten to the meeting of glory!